2003. "Blaze" is the third CD release by ARC and their second CD on the DiN label. The duo is comprised of DiN founder Ian Boddy and Mark Shreeve and the pair are joined on the album by guest musician Carl Brooker who plays drums on four of the discs eight tracks. 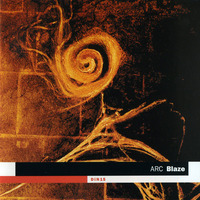 Boddy first approached Shreeve in 1998 to set up the ARC project to run alongside Redshift in a more experimental and ambient vein. Their first disc "Octane" was released on Something Else Records and was premiered at the alpha-Centauri festival in the Netherlands. "Radio Sputnik", the duos second CD was released as DiN 7 in 2000 and was a document of this concert.